COOLDO Medium frequency induction melting furnace is with the most advanced& up-to-date technology design .The Melting capacity range varies from 10KG ~ 60 tons. It is mainly used for smelting ferrous and non ferrous metals, such as scrap iron, alloy steel, copper and aluminum, as well as smelting of precious metals such as gold and silver. Induction furnaces use electromagnetic induction to heat and melt metal such as silver, gold, platinum, iron, steel, zinc, platinum, bronze, aluminum, copper, brass, and silicon for a variety of industrial purposes. These furnaces deliver clean, energy-efficient melting capabilities through controlled processes, and are capable of reducing production losses. Induction furnaces also reduce dust and other pollutants generated by industrial processes. 2), The constant power control board which can monitor the variation of voltage and current automatically improves melting efficiency! 3), There is only one turn on/off switch and one power adjustment knob for easy operation. 1, Fast Melting speed , melting temperature is uniform, the oxidation loss is less, and the metal composition is uniform. 2, Strong adaptability , flexible usage in melting. In the medium frequency induction furnace, the molten steel can be completely pour out of the furnace, change the melting material is convenient. 3,Adopt Excellent coil design and high quality thick wall copper tube, the reasonable optimization of design parameters which make the induction coil conversion efficiency the highest, the minimum resistance, more energy can be used in smelting, and our induction coil is not easy to cause damage due to the arc and expansion force. 4, The solid coil support system makes every coil tightly locked, eliminating inter turn short circuit, and overcoming the driving force of electromagnetic force, which can greatly prolonging the service life of lining. 5, The lining leakage alarm system is installed in the bigger capacity furnace, not only to detect the leakage of the furnace, but also can connect the high pressure to the ground to ensure the safety of the operation. 6,Aluminum Shell furnace body , reasonable structure, low cost;steel shell furnace furnace body with The magnetic yoke which can concentrate the magnetic field around the coils to generate thgreat melting efficiency. 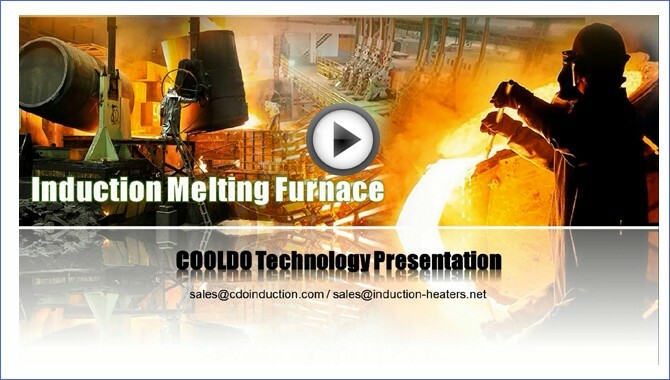 1), Cooldo Induction Melting Furnace are available in capacities ranging from 1.0T to 60 Tons. 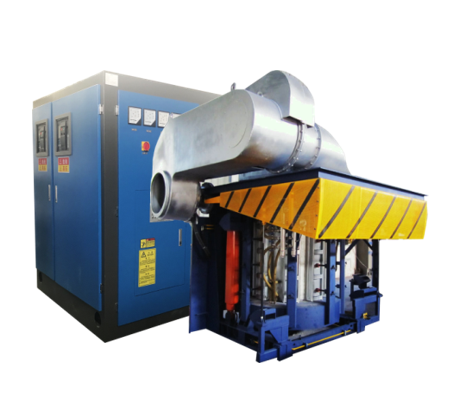 2), These Induction furnaces are ruggedly built with heavy structural steel for trouble free operation under harsh melt shop conditions. 3), Thick walled rectangular coil sections are used to minimize coil losses. The higher coil efficiency ensures energy savings and higher productivity. 4), Special coil insulation prevents inter turn sparking. Highly reliable with several protection levels site fault, excluding any human error factor. It is the main managing element of the whole system, equipped with the timer, heating elements temperature control. This censor digital-controller should be additionally installed into the frequency thyristor converter in order to improve general work process, providing dozens programs storage, keeping archives up- to-date.The display reflect in a real-time-mode all processes information: power (kW), voltage loose (A), cranking voltage (V), capacitor voltage (Hz). Big volume capacitors interconnected and adjust to the equipment power source; Maid of metal frame with capacitors installed above, including terminal blocks and pipes for the cooling liquid. Compose of steel frame with the hydraulic bias and induction coil. The coil is installed upon the steel frame and insulated with high-temperature materials that protect the coil from the concrete lining and overheating of the material. It is installed upon melting units with hydraulic, and has additional hydraulic fluid power with the control panel. It is used to exhaust gases and steams (toxic). Compose of pumps, valve system and control panel, connected with the hydraulic bias control panel. It is used to change the lining quickly; it is compose of hydraulic pushing cylinder. This mechanism drastically reduces lining change process. Flexible and firm cable to connect melting unit with the capacitors batteries that power up the coil and cooling it with the liquid simultaneously. Installed in front of the electric cabinet, plays the role as the Isolation switch funtion in the power supply line, Equipped with a manual switch, automatic switch, voltage-loss protection, over-current protection function.Can display the current through the digital, can have the function of the real-time monitoring,if any problems with the equipment,it can cut off the current at once, thus can protect the safety of the transformer. Control lines are completely isolated in a separate area.Effectively reduce electromagnetic interference,which can Keep control room clean and keep in a cool temperature , which Greatly improve the life of the circuit board and system reliability. Isolate the rectifier and inverter,Provide security protection for maintenance,In the ground position, both the inverter and the furnace body coil are in a safe place.